One man’s trash is another man’s treasure! You can sustainably reuse many materials as garden features in your outdoor room or urban garden, from old skis and bicycles to antique furniture and bed frames. We’re sure you can find at least a few old items around your home or at yard sales that you can repurpose into a garden art feature. Repurposed garden art is great because it can illustrate your personal interests (such as skiing) and provide great conversational elements when entertaining guests. Studies even show that art can help redirect feelings and improve one’s mood. Of course, gardening is an experiential process that helps improve mood as well. Antique bed frames: Use as a stand-alone vertical accent feature or use it to help climbing vines, bean plantings, or climbing accent plants like roses, clematis, or ivy. Bicycle frames: Use for climbing vines or bean plantings by digging out a small trench in the garden and burying a portion of the frame to secure it in place vertically. Also think about securing the bike frame upside down as another option. Chairs: Antique chairs make wonderful garden accents. Think about securing a few older wooden chairs together to develop a distinctive sculptural piece. You can also use chairs as planters. See the nearby sidebar “Adventure gardening” for details. Small dressers: An old dresser can make a great planter. Pull out and secure each drawer to different lengths, with the top drawer opened slightly and the bottom drawer opened as much as possible to create a terraced planter. Cut a rectangular opening out of the cabinet top so you can plant in the top drawer area. Fill each drawer with soil mix, and then plant an assortment of your favorite plants to accent your new garden art feature. Tools: Old tools make wonderful and useful decorative garden features. If you have an old shovel, rake, hoe, or pitchfork, don’t throw it away. Recycle and repurpose it as a showcase item for your garden instead. For example, a few old rakes can be secured together as a climbing structure for pole beans. And old watering cans make unique containers when filled with soil and cascading plants. Sign holders: Metal frames that held campaign or business signs work well as repurposed supports for shorter vegetable plantings. Cans: Cover coffee cans with wallpaper samples or contact paper to create lovely vases. Fill them with flower cuttings and offer to friends, or use them as a centerpiece for your outdoor room. Cans also make handy and durable seed scoops for wild birdseed and for scooping soil into pots when starting seeds. Cardboard boxes: Lay large pieces of cardboard in garden paths and cover with straw or mulch. The cardboard provides a durable barrier layer to prevent weed growth. Coffee filters (used): Reuse your used coffee filters for collecting and drying seeds. You can also place them in the bottom of pots to keep the soil from running out the drainage hole and to prevent slugs from crawling in. Paper: Newspaper and all uncoated junk mail can be composted. Place the paper in the garden, cover it with grass clippings, and the worms will find it and break it down. You can also start a worm-composting project with a small trash can or bin. Shred the newspaper; moisten it; add a bit of soil, mulch, or fallen leaves; and then add some composting worms. The castings left by the worms make rich fertilizer for your garden plants! Plastic milk jugs: Help eliminate watering waste with these common jugs. Simply cut off the bottom inch or so of your used half-gallon plastic jugs, and bury the necks in soil next to plants that require a lot of water (pumpkin and tomato plants, for example). Then you can fill the upended jugs with water daily to provide targeted watering to your garden plantings. String: Hang pieces of old string or twine around the yard on trees or shrubs for birds to use as nesting material. Toilet paper tubes: These tubes are great for seed starting! Cut four 1-inch-long slits in one end and fold the tabs inward to create a pot with a bottom. Fill with soil and sow seeds. Plant the tube outside, and it will break down on its own so you don’t have to worry about removing it. Give the plants plenty of light and air circulation to prevent mold growth. Pallet gardening: Pallets are being reused extensively in the garden today. One idea is to reconstruct pallets into vertical garden features (which are great for small or tight spaces). You can remove and relocate some of the planks to form a series of tiered horizontal planter boxes along your pallet garden. Avoid chemically treated pallets. Chemicals from the treated wood may slowly leach into the soil over time. 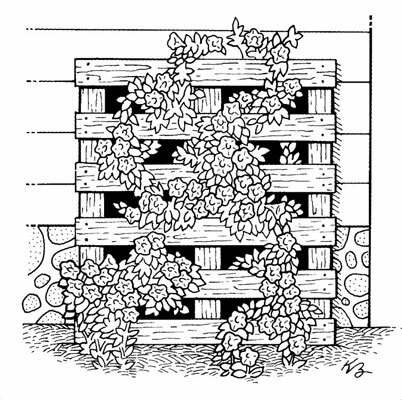 One way to avoid this is by using pallet gardens only for your flowering annuals and climbing vines, but not them for vegetable gardens because the pallet wood may have been chemically treated even if it might not look like it.